I love number games and was excited to find this great interactive resource. 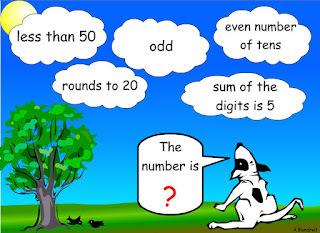 You can play Thinking of a Number with your students on your Smartboard or Interactive WhiteBoard. Click the clouds to reveal hints about the target number. The answer is revealed when you click the question mark. Get a new number by clicking the dog. By the way, the answer to this number puzzle is 23. Have fun!